In case you haven’t noticed yet, I like to craft! While I try to do my own original ideas most of the time, there is occasionally a project that is so cute, so awesome that I simply cannot resist! That’s the case with my new voodoo doll pincushion. Isn’t he adorable? This little fella’ can be found over at Indie Spotting. There’s a DIY and a free pattern. I couldn’t help but use the same colors that Erika at Indie Spotting did, but veered away from the original a bit in the details on my little guy. I didn’t use buttons for eyes, my mouth is a bit different, I didn’t break the heart and I added leg bones. Anything could go really! Then comes the biggest difference! 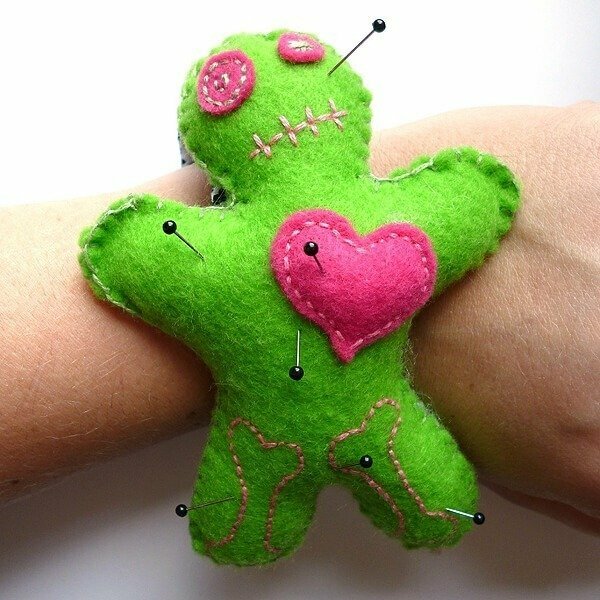 I made it with a Velcro strap so I can wear my voodoo doll pin cushion on my arm while I am sewing. I have to admit that when I’m busy and jabbing pins in there, sometimes I’ll catch a glimpse at how funny the whole thing is and it brings me a brand new smile to my face! If you’re into sewing and giggling – I’d highly recommend you make your own. With just a little bit of stuffing and felt you can be on your way. 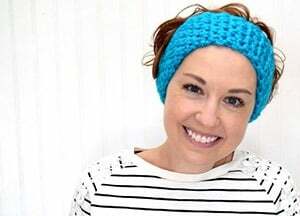 It will bring a smile to your face and useful sewing accessory for your wrist. Just don’t get so used to wearing it that you stab yourself when you’re not! :) Check it out! How long did you make the strap? btw, super cute! Hey, Leilani – all I did to make the strap was take a piece of fabric, fold it over to the right width with the edges turned over. Then I sewed the edges shut and sewed velcro onto the fabric piece, easy peasy!